Texas Homeland Title is happy to handle the closing of your For Sale By Owner (FSBO) transactions. For a brief explanation of exactly what our services are and why you probably need them if you are selling or purchasing real estate, please see our Frequently Asked Questions (FAQ's) page. You begin by “Opening Title” with us by delivering the contract, executed by both buyer(s) and seller(s), and the earnest money check (made payable to Texas Homeland Title) to us. We will deposit the check into our escrow account and hold the funds until disbursement at closing. Then we go to work. Then we perform a title search and issue a “Title Commitment,” which is our commitment to insure the title to the property. If a new survey of the property is required, we will order it, receive it and review it. We research the status of property taxes and home owner’s association dues on the property, and determine the split between buyer and seller for the current year. If the buyer will be borrowing money to purchase the property, we communicate and coordinate with the lender to receive the loan documentation, and oversee the signing of all documents at the closing table. Prior to the closing, we prepare a closing statement (in transactions where the buyer is receiving a federally insured loan, this is prepared on a HUD-1 form), which sets forth the amount of all monies which will be paid to at closing, and to whom (surveyors, home inspectors, residential service contract companies, the lender, etc.) which you will review and approve. Finally, after all this is complete, we sit down at the closing table with you. All documents are signed and notarized, and the remainder of the purchase money is received and deposited into our escrow account (either via wire transfer from the lender or cashiers check from the buyer). When all documents are executed and approved, we pay any existing loans or other liens on the property, pay service providers (if any), deliver and pay for recording the legal documents in the real property records of the county in which the property is located, and disburse the remaining money to the seller. 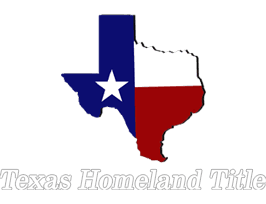 It sounds very complicated, but the important thing to remember is that Texas Homeland Title will do it all for you. Give us a call and we'll be happy to discuss this process with you.